B.S. and M.S. (Biochemistry and Medical Technologist), School of Chemical Sciences, National University of Cordoba, Argentina, 1994. Ph.D., School of Chemical Sciences, National University of Cordoba, 2004. Dr. Bonacci’s research plan is focused on understanding the mechanisms that lead to the formation of nitro-fatty acid during inflammation. In response to inflammatory process, several bioactive lipids are generated as a result of enzymatic oxygenation or free-radical reactions. These bioactive lipids are involved in modulation of different stages of the inflammatory process, ranging from initiation to its resolution. Lack of regulation can be translated in exacerbated inflammatory responses, leading to detrimental chronic stages. Among these bioactive lipids, the generation of electrophilic nitro-fatty acid derives from radical reactions mediated by pro-oxidative species and reactive nitrogen oxides (RNS), such as nitric oxide (•NO), nitrogen dioxide (•NO2), nitrite (NO2-) and peroxynitrite (ONOO-). The electrophilic nature of nitro-fatty acid facilitates their adduction with cellular nucleophiles such as cysteine and histidine residues in proteins. In terms of cellular signaling, we described several protein targets of posttranslational nitroalkylation modification, resulting in activation of pro-MMP9, PPAR¥ and the antioxidant pathway Keap1/Nrf2 and the inhibition of the pro-inflammatory transcription factor NF-kB. Recent findings indicate that mitochondria may act as a reactor for lipid nitration reactions under inflammatory condition of ischemia/reperfusion, in a process characterized by 1) exacerbation of oxidative stress, 2) low O2 tension, 3) acidic conditions and 4) availability of unsaturated fatty acids as a substrate. Thus, the implication of nitro-fatty acid signaling on mitochondrial respiration and function are closely associated with the cytoprotective effect found on cardiac tissue. Because of our interest on the biogeneration of lipid signaling mediators in vivo, we have developed different approaches using mass spectrometry to structurally characterize and identify new nitrated lipid compounds. Particular efforts are directed to elucidate the endogenous molecular mechanisms leading to the nitration reactions of unsaturated fatty acids, with particular emphasis on substrate and product characterization. 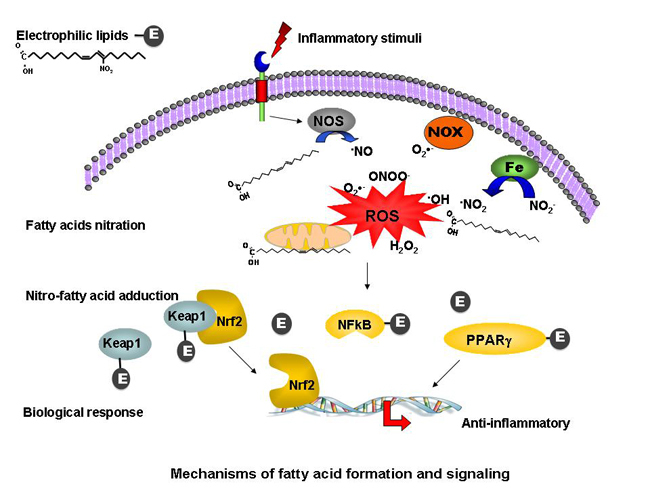 Furthermore, the implications of nitro-fatty acid formation and signaling under inflammatory conditions using cellular and animal models are being studied. Bonacci G, EK Asciutto, SW Woodcock, SR Salvatore, BA Freeman and FJ Schopfer. Gas-phase fragmentation analysis of nitro-fatty acid. J Am Soc Mass Spectrom, in press 2011. Bonacci G, FJ Schopfer, CI Batthyany, TK Rudolph, V Rudolph, NK Khoo, EE Kelley and BA Freeman. Electrophilic fatty acids regulate matrix metalloproteinase activity and expression. J Biol Chem 286:16074-16081, 2011. Kansanen E, G Bonacci, FJ Schopfer, SM Kuosmanen, KI Tong, H Leinonen, SR Woodcock, M Yamamoto, C Carlberg, S Yla-Herttuala, BA Freeman and AL Levonen. Electrophilic nitro-fatty acids activate NRF2 by a KEAP1 cysteine 151-independent mechanism. J Biol Chem 286:14019-14027, 2011. Groeger AL, C Cipolliina, MP Cole, SR Woodcock, G Bonacci, TK Rudolph, V Rudolph, BA Freeman and FJ Schopfer. Cyclooxygenase-2 generates anti-inflammatory mediators from omega-3 fatty acids. Nat Chem Biol 6:433-441, 2010. Rudolph V, TK Rudolph, FJ Schopfer, G Bonacci, SR Woodcock, MP Cole, PR Baker, R Ramani and BA Freeman. Endogenous generation and protective effects of nitro-fatty acids in a murine model of focal cardiac ischaemia and reperfusion. Cardiovasc Res 85:155-166, 2010. Schopfer FJ, MP Cole, AL Groeger, CS Chen, NK Khoo, SR Woodcock, F Golin-Bisello, UN Motanya, Y Li, J Zhang, MT Garcia-Barrio, TK Rudolph, V Rudolph, G Bonacci, PR Baker, HE Xu, CI Batthyany, YE Chen, TM Hallis and BA Freeman. Covalent peroxisome proliferator-activated receptor gamma adduction by nitro-fatty acids: Selective ligand activity and anti-diabetic signaling actions. J Biol Chem 285:12321-12333, 2010. Bonacci G, LC Caceres, MC Sanchez and GA Chiabrando. Activated alpha(2)-macroglobulin induces cell proliferation and mitogen-activated protein kinase activation by LRP-1 in the J774 macrophage-derived cell line. Arch Biochem Biophys 460:100-106, 2007.